Everyone loves to unveil hidden secrets. 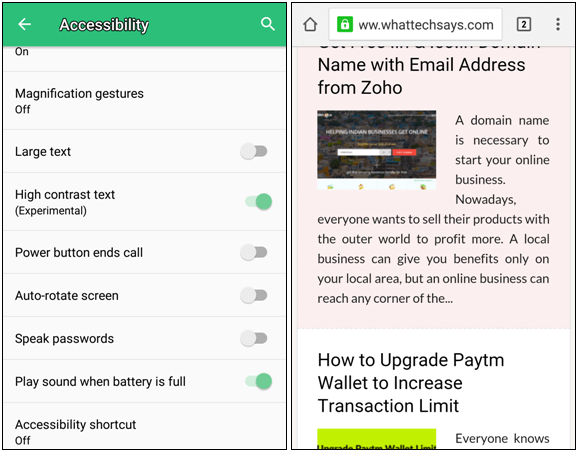 So, in this post, I am going to tell you some hidden and secret Android tricks probably you don’t know. All these features are very useful for those, who wants more from their gadgets. Android is a most popular mobile operating system. With the launching of a major update, it introduces many new and amazing features. You should check all new features of Android Marshmallow which are only available on few devices. Android is a Linux-based OS. So, it is very powerful if you have rooted. A pro user only knows how to use a smartphone properly. Beginners always face problems due to lack of knowledge. Before buying any smartphone, you should first research about the hardware and software specifications. A little bit idea about secret Android tricks 2016 could make you smarter than your friends. All these Android hidden tricks are tested on Lollipop devices. If you are using a lower version of Android, then they might not be available on your device. In Lollipop, the notification is a big problem. At the time of watching a movie or doing something else on the Internet, the notifications are start showing on the front of the screen. The limited notifications are ok, but in case you get 20-30 emails or Whatsapp messages at a time, then it might irritate you. 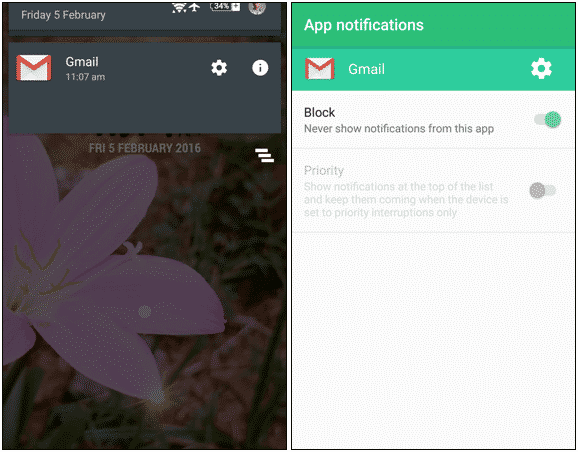 There is an easy secret Android trick to turn off the notification of an app. Suppose you got an email on your Gmail app, then it’ll show in the notification area. Just long tap on that notification and you’ll see a symbol at the right side of the notification. Tap on it to open the App notifications setting. Here you can adjust the notification Priority or can block it permanently. This is one of the best secret Android tricks 2016 available for old peoples. The smartphone comes with a small screen and reading tests on a smaller screen, especially on the low-resolution phones are too difficult. If the texts are in gray color, then it might difficult to read for those whose vision power is low. There is a hidden feature on Android Lollipop for those people to read texts on the phone clearly. Go to your phone’s Setting and open “Accessibility” option. Here you’ll get a lot of useful options. Scroll down the screen and enable “High contrast text” option. Now all texts on your phone will visible with high contrast and clear for reading. A password on your smartphone protects you against unauthorized access. If you use your phone frequently, then the password feature could bother you. You have to put the password again and aging to unlock your phone. If you are at home and you don’t want to use the password feature, then the Smart Lock feature would help you. 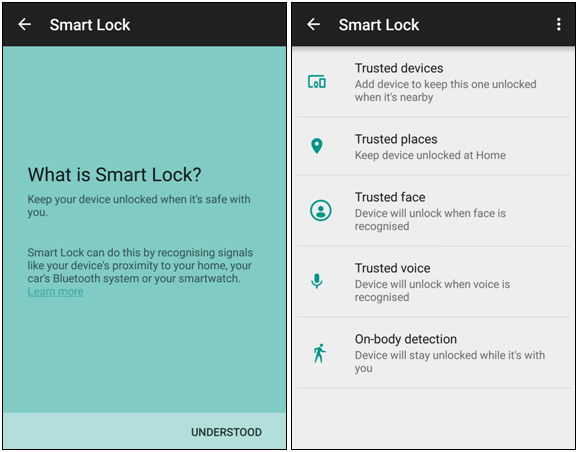 Smart Lock is one of the best secret Android feature comes on Lollipop devices. Go to your phone Settings >> Security >> Smart Lock. Here you’ll get some options like, Trusted devices, Trusted places, Trusted face, Trusted voice and On-body detection, etc. Trusted places and On-body detection is quite useful. Tap on “Trusted places” and select “Home” to find out your home location. Either enters your home address or let the Google to find it for you using your GPS. After that, your phone will stay unlocked on the 80-meter radius of your selected area. You can use “On-body detection” as well to keep your phone unlocked when it is with you. Sometimes you kept your smartphone somewhere in your home and totally forget about it. The easy way to find a lost phone is, just call it from another number. In case, your phone is on silent mode, the what will you do? The phone ring method will not work in this situation. But using this secret Android trick, you can easily locate your phone. Every Android phone comes with a pre-installed Android Device Manager. This will help you to find your phone. Read the complete article to find a lost Android phone on silent at home. When you got a call, your phone shows an option to reject that call with message. Every phone comes with some predefined message templates to use as a call reject message. You can use them, but if you have another situation which is not available on that list then you can send your own message. If you want to create your own rejection message, then follow the below hidden Android trick. Go to your phone’s Settings >> Call. 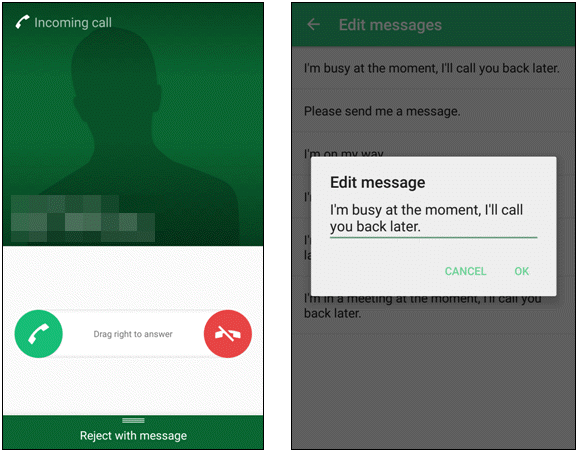 Open “Reject call with message” option. Here you’ll see the complete list of rejection messages. You can’t add another message on that list; you have to edit one of the messages. Tap on a message types your own text and tap on the OK button to save it. Next time, when you’ll get a call, you’ll see your own text on that list. These are some hidden and secret Android tricks 2016 available on Lollipop devices. If these tricks are working on the lower version of Android devices, then don’t forget share with us. Hi Chandan, Regarding your Custom Reject Message I would like to inform you that I am not able to find Call option in Settings.